Salvador Perez tags out Ian Kinsler at home plate in the ninth inning to send the game to extras. 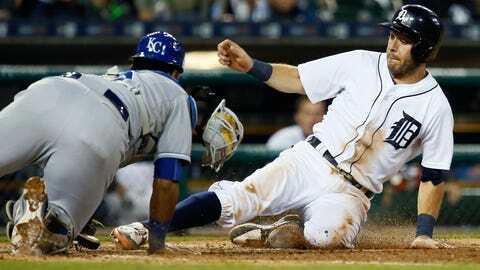 DETROIT — Ian Kinsler homered in the 11th inning to give the Detroit Tigers a 6-5 victory over the Kansas City Royals on Saturday night. Kinsler led off the 11th against Miguel Almonte (0-1) and hit a 1-2 curveball into the Tigers’ bullpen for his second walk-off homer against Kansas City this season. He also hit one on August 6. The celebration at home was Kinsler’s second in three innings, but this one counted. Kinsler was initially called safe at home on a sacrifice fly in the ninth inning, setting off a mob scene at the plate. However, a replay review showed Royals catcher Salvador Perez caught Jarrod Dyson’s off-line throw and caught the tip of Kinsler’s shoe with a diving tag to end the inning. Neither starter was involved in the decision. Tigers rookie Matt Boyd ended a lengthy slump, allowing two runs and three hits and a walk in six innings. Boyd, who was acquired from Toronto in the David Price trade, struck out six — one short of his career best. The Royals took a 1-0 lead in the second on Kendrys Morales’ 18th homer, but Miguel Cabrera answered with a two-run single in the third. Cabrera now has four RBIs in the last two games after a 12-game slump in which he had only one. Mike Moustakas tied the game on the second pitch of the fifth, hitting a fastball an estimated 425 feet over the out-of-town scoreboard in right-center field. Detroit, though, regained the lead in the bottom of the inning when Victor Martinez’s flyout to the 420-foot sign in center field easily scored Cabrera. Eric Hosmer led off the seventh with a double off Blaine Hardy, and took third as Kinsler robbed Morales of a hit with a diving stop-and-throw. Moustakas couldn’t drive home the run, grounding out, and Tigers manager brought in Al Alburquerque to face Jonny Gomes. Alburquerque got ahead 0-2 but then threw a wild pitch, allowing Hosmer to score the tying run. Victor Martinez ripped a two-run homer off Chris Young in the bottom of the inning, putting the Tigers up 5-4, but Hosmer tied the game with a home run off Bruce Rondon in the top of the eighth. It was Hosmer’s first homer since Aug. 14. Royals: 2B Omar Infante (oblique strain) and SS Alcides Escobar (elbow contusion) both sat out Saturday’s game after sustaining injuries on Friday night. Escobar, who was hit by a pitch, could play as soon as Sunday, while Infante will undergo tests Monday in Kansas City and could miss the rest of the regular season. Tigers: 3B Nick Castellanos (groin strain) returned to the starting lineup after Tuesday’s injury. He pinch hit in Friday’s extra-inning win but did not play the field.